Half of all global deaths were caused by just four risk factors in 2017 – high blood pressure, smoking, high blood glucose, and high body mass index, according to the latest Global Burden of Disease report. Improvements in global mortality rates seen in recent years have become less pronounced overall and rates stagnated or got worse in some countries in 2017. The report also found that low back pain, headache disorders, and depressive disorders were the three leading causes of disability globally in 2017. Improvements in global mortality rates were less pronounced overall, and rates stagnated or got worse in some countries in 2017. Globally, fertility rates have declined since 1950. In 91 nations, fertility rates are not high enough to maintain current population, and in 104 nations high fertility rates are driving population increases. Half of countries estimated to face shortfall in healthcare workforce – with 47% of having fewer than 10 doctors to serve 10,000 people and 46% having fewer than 30 nurses or midwives to serve 10,000 people. Emerging adverse trends (such as conflict and terrorism, and the opioid crisis) could lead to negative shifts over time if action is not taken. Half of all global deaths were caused by just four risk factors in 2017 – high blood pressure, smoking, high blood glucose, and high body mass index (BMI). Low back pain, headache disorders, and depressive disorders were the three leading causes of disability globally in 2017, and have prevailed as leading causes for nearly three decades. The latest global estimates for the state of the world’s health from the Global Burden of Disease study (GBD), published in a special issue of The Lancet, highlight that global progress in health is not inevitable. This year’s GBD study estimates that improvements in mortality rates for adults were less pronounced overall and stagnated or got worse in some countries in 2017. In addition, no countries are on-target to meet the United Nation’s Sustainable Development Goals to improve health by 2030. Total fertility rates, which represent the average number of children a woman delivers over her lifetime, have declined since 1950. In 2017, 91 countries (including Singapore, Spain, Portugal, Norway, South Korea, and Cyprus) had rates lower than two and were not maintaining their current population size, while 104 nations were seeing population increases due to their high fertility rates (total fertility rates above two). The lowest rate was in Cyprus, where, on average, a woman would give birth to one child throughout her life, as opposed to the highest, in Niger, with a total fertility rate of seven children. Emerging adverse trends could lead to negative shifts over time if action is not taken – for example, conflict and terrorism is an increasing threat to global health (with numbers of related deaths increasing by 118% between 2007-2017), and an era-defining epidemic of opioid dependence continues – with more than 4 million new cases and around 110,000 deaths in 2017. In addition, half of all global deaths (51.5%, 28.8 million of 55.9 million deaths) were caused by just four preventable risk factors in 2017 (high blood pressure [10.4 million deaths], smoking [7.1 million deaths], high blood glucose [6.5 million deaths], and high body mass index [4.7 million deaths]), presenting a public health challenge and an opportunity for action. The study is coordinated by the Institute for Health Metrics and Evaluation (IHME) at the University of Washington, Seattle (USA), and involves more than 3,500 collaborators from across more than 140 countries and territories. The study is presented in 7 new papers in The Lancet, ranging from estimates of population and fertility, causes of death and disability, and measuring progress against the Sustainable Development Goals. For the first time, the estimates include a global analysis of health worker density using surveys and census data on people’s occupations. The authors note that the figures cannot estimate the quality of care, only the number of health workers available. Historically, in 2006, the World Health Organization (WHO) estimated that there should be a minimum of 23 physicians, nurses, or midwives per 10,000 population. However, this estimate has not since been updated and the study authors expect that larger, more varied health workforces are needed to provide a broader range of services and achieve universal health care. Although no target was set, the United Nations pledged to increase the health workforce in developing countries in Sustainable Development Goal (SDG) 3.c.1. The authors estimate that having more than 30 physicians, 100 nurses or midwives, and 5 pharmacists for every 10,000 people in the population has diminishing returns for healthcare access and quality. Overall in 2017, the estimates suggest that only 41 out of 195 countries had more than 30 physicians per 10,000 population, while only 28 countries had more than 100 nurses or midwives. Almost half (47.2% - 92 of 195 countries) of the countries included had fewer than 10 physicians per 10,000 people, while 46.2% (90/195 countries) had fewer than 30 nurses or midwives for every 10,000 people. 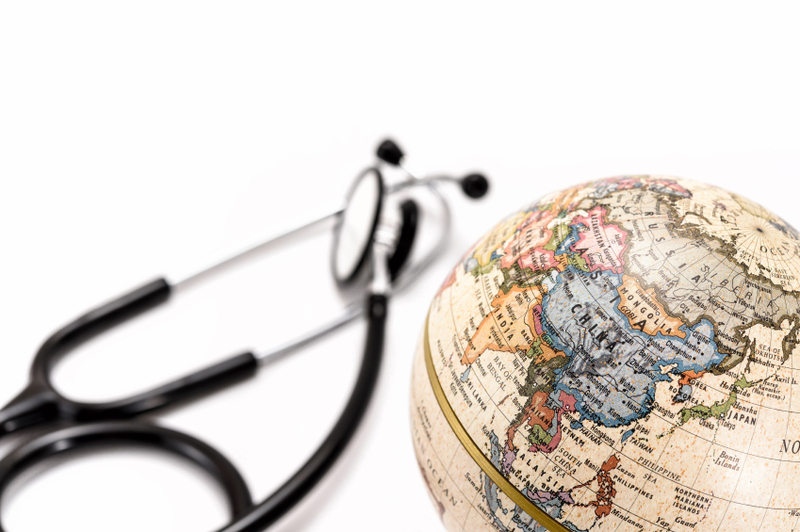 The authors note that the study does not include physicians and nurses by speciality, which may be important for understanding the workforce shortfalls for each country’s varying burden of disease. In future, the GBD study will refine health worker estimates by using more recent occupational data. Non-communicable diseases (NCDs) comprised the greatest fraction of deaths globally in 2017 (contributing 73.4% of total deaths, equivalent to approximately 41.1 million deaths). The total numbers of deaths from NCDs increased from 2007 to 2017 by 22.7% (from 33.5 million in 2007 to 41.1 million in 2017), representing an additional 7.6 million deaths in 2017. While the age-standardized death rate from NCDs decreased globally between 2007-2017 by 7.9%, this change was smaller in the most recent period – slowing from a decrease of 7.8% between 2003–07 to a decrease of 2.1% for 2013–17. The largest numbers of deaths from NCDs were from cardiovascular diseases (17.8 million deaths), neoplasms (9.6 million deaths) and chronic respiratory diseases (3.9 million deaths). The prevalence of obesity continues to rise in almost every country in the world, with more than one million deaths estimated as being due to type 2 diabetes, almost half a million (426,300 deaths) deaths due to diabetes-related chronic kidney disease, and more than 180,000 deaths due to non-alcoholic steatohepatitis (NASH)-related liver cancer and cirrhosis in 2017. Low back pain, headache disorders, and depressive disorders were the three leading causes of disability globally in 2017, and have prevailed as leading causes for nearly three decades, while diabetes has emerged as the fourth leading cause of disability globally. In 2017, there were 245.9 million new cases of low back pain, 995.4 million new cases of headache disorders, 258.2 million new cases of depressive disorders, and 22.9 million new cases of diabetes. Half of all global deaths (51.5%, 28.8 million of 55.9 million deaths) were caused by just four risk factors in 2017 – high blood pressure, smoking, high blood glucose, and high body mass index (BMI). High blood pressure was the leading risk factor, accounting for 10.4 million deaths, followed by smoking (7.1 million deaths), high fasting plasma glucose (6.5 million deaths), and high body-mass index (4.7 million deaths). The burden of dengue fever has increased over time in most tropical and subtropical countries, with the number of deaths globally increasing by 65.5% between 2007 and 2017 (from 24,500 to 40,500 deaths) and the age-standardized mortality rate increasing by 40.7% (from 0.4 to 0.5 deaths per 100,000). In addition, there were an estimated 104.8 million new cases of dengue in 2017. The disease is a notable exception in the estimated improvements for communicable diseases and might reflect changes in the range of its primary vector, Aedes aegypti. Women have longer lives but live more years in poor health. At the global level, between 1950 and 2017, life expectancy increased from 48.1 years to 70.5 years for men, and from 52.9 years to 75.6 years for women. In 180 of 195 countries, women were expected to live longer than men in 2017, with extra years lived varying from 1.4 years in Algeria to 11.9 years in Ukraine. Of the extra years gained, the proportion spent in poor health varied considerably across countries. In Bosnia and Herzegovina, Burundi, and Slovakia, less than 20% of additional years were spent in poor health, whereas in Bahrain all the extra years were spent in poor health.